Brooklyn’s game plan centred on stopping Whizzer White and they certainly succeeded in achieving that objective. White’s 15 carries saw him with a -1 yard net yardage. While the Dodgers kept White in the dark, his teammates, Tuffy Thompson and Stu Smith, shone. Frank Filchok quarterbacked the Pirates to an easy victory that reflected a great improvement in Pittsburgh’s blocking. The Dodgers scored first with an 18-yard field goal after the opportunity had been gifted through a Pirates fumble. Although Pittsburgh dominated the game, they had nothing to show for their efforts until the third quarter. 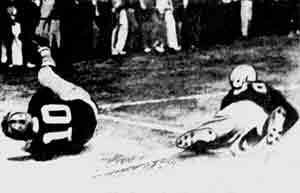 A Brooklyn fumble was recovered by Ed Manske and returned 27 yards for a touchdown. A Pirates’ 18-yard field goal followed before in the final period, Thompson and Smith took the ball downfield on a series of reverses to complete the scoring 17-3. Played at Ebbets Field in front of 21,494 fans, coach Blood began to think the corner had been turned and the Pirates were now a force to be reckoned with. Coach Blood was given the credit for the Pirates’ win. “Chiefly, the honours belonged to Blood, the only player-manager in the league and older than his program age of 34,” wrote one scribe. “Pittsburgh went places when he was in the backfield and he was in there more than half the game. Blood, a transfusion in himself,“ the reporter continued, “did the best blocking on the field. Calling the plays, old John was responsible for a bit of generalship that drove the grandstand quarterbacks frantic. In the fourth quarter, leading 7-3 with the ball on the Brooklyn 44-yard line and a fourth and 14, he called for a pass from Frank Filchok to Bill Davidson. Davidson had to outwrestle Jon Maniac for the ball, but he got it and the play was good for 29 yards, paving the way for a field goal by Armand Niccolai. Whizzer White led a fourth quarter Pirates drive to score Pittsburgh’s second touchdown as they finished 16-6 victors. The Pirates won their first game at the Polo Grounds and made it three straight victories. The combination of Frank Filchok and Wilbur Sortet gave the impetus to the Pirates against the Giants to continue their winning ways. Whizzer White played his part in a supporting role that consistently gained yards to keep the Pirates drives going. Filchok set up the first touchdown with his interception that gave the Pirates a series from their opponents 32. Runs from Ed Farrell and White moved the ball to the 24 in three attempts. On fourth down, Filchok faded back before passing to Sortet, who carried it in from the one. The Pirates dominated the game with White gaining 73 yards from scrimmage and returning punts for a total of 103 yards. Midway through the final quarter, White set up Pittsburgh’s second touchdown. Filchok returned a punt to the Giants’ 45. White then took the ball to the 26 for a first down. After an offside penalty, White moved the ball to the 15. With the drive appearing to stall, on fourth down, Filchok again found Sortet in the end zone. With the attempted extra point failing, the final score was Pirates 13, Giants 10. The Pirates next clash against the Brooklyn Dodgers was an eagerly awaited matchup as fans were now enjoying their team winning games. The game was originally scheduled as a night game later in the month, but with the baseball team not making the World Series, Forbes Field became available for football. Despite fielding fourteen rookies, the Dodgers were confident of overcoming White and the Pirates. In Boyd Brumbaugh, Brooklyn had a player from Duquesne who had thrilled the local fans with his play and loyalty would be delicately balanced between Brumbaugh and the Whizzer. With 8,372 paying customers, the Pirates were intent on showing local gridiron fans how much they had improved since the last game at Forbes Field. The early injury to their center, Mike Basrak, took the wind out of their sails and they slumped to a 7-17 defeat that saw them slip to the basement of the Eastern division. Brooklyn’s Ace Parker, not Whizzer White, was the star of the game. Parker made the most of the absence of the Pirates’ starting center. The Dodgers took the lead in the second quarter with a 34-yard field goal that followed a White interception. Parker then returned a punt 37 yards to give Brooklyn good field position, but they missed a field goal from 32 yards. White then led his team on a five-play drive of 80 yards that was topped with his touchdown pass to Wilbur Sortet. Three plays later, the Dodgers had regained their lead. A flea flicker play saw Parker’s pass find a teammate beyond the Pirates’ secondary to run in the touchdown. Parker kicked the point after and Brooklyn led 10-7. Late in the third quarter with the game still in the balance, Parker powered his way through the Pirates defense for a 77-yard touchdown run and the Dodgers had a 17-7 victory. “‘We haven’t Given Up’ says Rooney after Sale of Stars,” ran the headline in the Pittsburgh Press October 11 after the Pirates hit rock bottom again slumping to 2-4. Art Rooney admitted the 1938 season was a losing proposition, but he was looking ahead to next season with the sale of Scrapper Farrell (Brooklyn), Frank Filchok (Washington) and Tom Burnette (Philadelphia) for draft privileges as well as their fee. The Pirates took $6,400 gate money for the Dodgers’ game. The league guarantees the travelling team $5,000 so Mr. Rooney was left with $1,400 for wages and stadium hire. To make matter worse for the team, they had been hit by injuries. Mike Basrak was out for the season with a broken leg, George Kakasic out for the season with an ankle fracture and Ted Doyle out for the season with a broken arm. Edgar Manske, obtained at the start of the season on loan from the Bears, had returned to Chicago and they had released Paul McDonough. The Pittsburgh Press ran a story on October 13 about Art Rooney contacting the Cleveland Rams and asking them to postpone the scheduled league game on October 18 because of the extensive Pirates injury list. Apparently, after initially agreeing with Mr. Rooney that it would be OK, they reneged and went screaming to the other owners requesting the Pittsburgh franchise be thrown out of the league. That was a moot point with Mr. Rooney as it was he who talked Cleveland into the league. The article did not support Mr. Rooney in his request, believing that a professional team shouldn’t resort to cancelling a game. The writer did accept that the Pirates were in the middle of their most “disheartening” season. After being thrown out of Forbes Field to make way for a World Series baseball game that didn’t happen they were compiling a losing season that initiates falling attendances. The writer also criticised the way the league had allowed teams to freely trade and sell players and went on to suggest the idea of hiring a commissioner should be progressed. Guard Vincent Farrar from Cincinnati and center Lou Tsoutsouvas from Cleveland joined the Pirates while Karl McDade and Hayden Mayhew were let go. The team were also pursuing Johnny Karrs, a fullback from Duquesne University who had been drafted by the Rams, but had not reported to the team. It was reported the team were still confident of winning a majority of the five remaining games and blamed their present poor situation on the jam-up of their early season games.